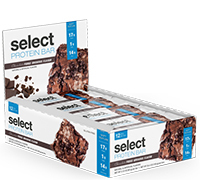 Each bar is high in protein & fiber while keeping the sugar low and net carbs in the low teens. Ingredients: Protein blend (calcium caseinate, partially hydrolyzed whey protein isolate, milk protein isolate, casein protein), chicory fiber, coating (maltitol, palm kernel oil, alkalized cocoa, whey protein, soy lecithin, natural flavor), soluble corn fiber, isomalto-oligosaccharides from tapioca starch, cocoa whey crisps (whey protein concentrate, tapioca starch, alkalized cocoa, calcium carbonate, sunflower lecithin), glycerin, peanut butter, alkalized cocoa, sunflower oil, natural flavors, sea salt, sucralose. Contains peanut, milk, and soy ingredients.